Workshop to be held on 23-25 September 2014. Venue: The University Club, University of Western Australia, Nedlands WA. Requirements: a laptop with R installed, along with the fpp package and its dependencies. We will also use the hts and vars package on the third day. 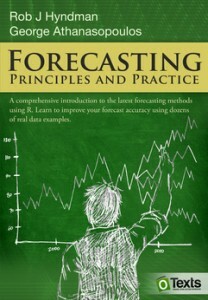 Forecasting: principles and practice, OTexts: Melbourne, Australia](http://www.otexts.org/fpp).